A cesarean for “Arrest of Descent” means a cesarean done after a woman has dilated fully and pushed for a while without the baby descending. The amount of pushing time required for the diagnosis varies from source to source but is usually at least 1-3 hours. Yesterday, at my appt, while speaking with one of the midwives – she asked if I wanted her honest opinion & that if I was unable to push out a 7 and 1/2 pound baby and 2nd babies are normally larger then she didn’t think it would be successful. The bottom line is that providers that are not truly VBAC-supportive often make women believe that something is wrong with their bodies and that they have little chance of having a vaginal birth, implying it’s better just to schedule a repeat cesarean. Then the care providers conveniently have fewer VBAC labors to attend. In the study, one hundred women who had one prior cesarean for Arrest of Descent had a “Trial Of Labor After Cesarean” (TOLAC or TOL). A whopping 84% ended up having a VBAC. This is an excellent rate and better on average than many VBAC studies. There are only a couple of studies that specifically use the term “VBAC after Arrest of Descent” so you have widen the search a bit. Other search terms to consider include “CPD + cesarean,” “cesareans after full dilation,” or “cesareans done during second stage of labor” (pushing), or “prolonged second stage,” or similar terms. Carefully vetted, these are essentially Arrest of Descent cesareans too. There is very little data on women who have had more than one cesarean for CPD. However, one 1989 study did contain some data on women like this. If you crunch the data in the full text of the study, women with 2 prior cesareans for CPD had a 56% VBAC rate. So although we don’t have a lot of data on this, what we do have suggests that even among women with more than one cesarean for CPD, more than half will have a VBAC. In summary, the majority of the research clearly supports the idea that women with a prior cesarean that occurred after full dilation and pushing can be offered a “trial of labor after cesarean” and will have a quite reasonable chance for a VBAC. In the end, the decision whether to go for a VBAC is the mother’s, but she should be reassured that she is just as likely to have a VBAC as not, and in many practices, especially with proactive care regarding fetal position, her chances are even better. In Arrest of Descent/CPD cesareans, the problem is usually the BABY’S POSITION, not the mother’s pelvis. Some providers become impatient and intervene with procedures (like breaking the waters) which may do more harm than good. Frequently, they are too quick to move to surgery when more patience might see the position resolve or the baby be born just fine in the “less-optimal” position. Recent research suggests that more than three-fourths of women with prolonged pushing stages (more than 3 hours) will deliver vaginally if just given a little more time. Keep in mind that Presentation refers to which part of the baby is presenting first, and Position refers to how the baby is oriented in the mother’s body in a head-down position. 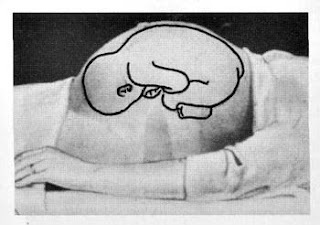 Also keep in mind that when describing fetal position, obstetric texts reference the back of the baby’s head (the occiput) and which way the occiput is oriented in relationship to the mother. Most laypeople find it easier to understand by thinking of which way the baby is looking, so I use both in my descriptions. 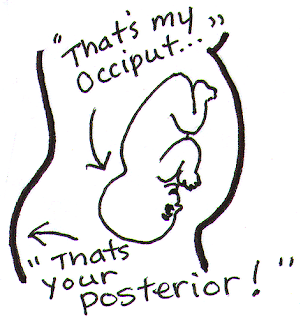 The easiest fetal position for labor and birth is usually Occiput Anterior. This is abbreviated OA and means the baby is head-down with the back of the baby’s head against the mother’s front; in other words, the baby is looking towards the mother’s back. This position is considered the norm and the vast majority of babies will be born in this position. Direct OA is when the baby is looking directly back at the mother’s sacrum. LOA is when the baby is mostly facing the mother’s back but his back is a bit towards the left side; ROA is the same but a bit towards the right side. Ideally, the baby’s chin is tipped towards its chest so the smallest possible diameter of its head presents. If the baby’s head is not well-flexed, the presenting diameter is a bit larger. If the baby’s head is tipped to one side or the other, it can be even larger. More on that below. One of the most common fetal positions that can cause problems during labor is the Occiput Posterior position. This is abbreviated OP; the back of baby’s head is against your back and baby is looking at your tummy. If the baby is directly facing your back, that’s direct OP; if it’s a little to the right or left, then that’s ROP or LOP. Research clearly shows that persistent posterior babies have higher rates of cesareans for CPD or Arrest of Descent. This is because the presenting head diameter of a baby in OP position is larger than the baby in an OA position. In addition, the back of the baby’s head is against the mother’s back and that makes for a more painful labor, with lots of back labor and a slower dilation. This in turn often means lots of interventions from care providers that may make the situation worse, like breaking the waters, which takes away the cushion for baby to turn more easily and may lead to fetal distress. However, OP babies do not always end with cesareans. With time and patience, an OP baby with a flexed head (chin to chest) can often be born vaginally. Alternatively, a vaginal birth may be possible if the care provider is patient and allows extra time for the baby’s head to mold enough to descend into the pelvis. 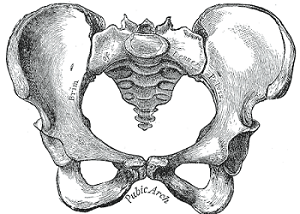 When it hits the pelvic floor, it often then rotates from OP to OA on the perineum and may be born quickly. 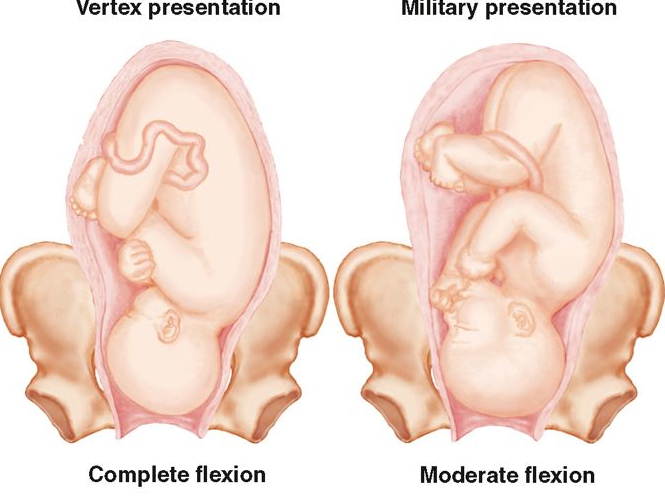 Often an OP baby can be helped to rotate to OA through manual rotation, an instrumental delivery, or maternal postural changes like the all-fours position. If a baby’s head is deflexed (not chin to chest), this can cause problems as well. A deflexed head makes the baby’s presenting head diameter larger. This means the baby may not fit through very well, or the baby needs extra time for its head to mold enough to get through. OA babies with mildly deflexed heads experience longer labors, but with a little patience, are usually able to be born vaginally. However, significant problems can occur if deflexion is extreme. Extreme examples of deflexed heads include a brow (forehead first) or face (face-first) presentation. Although vaginal births of brow and face presentations have been documented, most often they end in cesarean these days unless the baby’s position can be resolved. Fortunately, brow and face presentations are quite rare. Deflexed babies in an OP position are fairly common and result in many long, difficult labors. OP babies already start out with a larger presenting head diameter; when they also have deflexed heads (known as a “military” position), this makes the head diameter even larger. Big OP babies often have deflexed heads, making their head diameters even larger. These babies often have extremely long and hard labors, and many end in cesareans. Turn the baby around and/or tip its chin towards its chest so that the head is flexed and the baby would likely fit much better; many cesareans could be avoided. 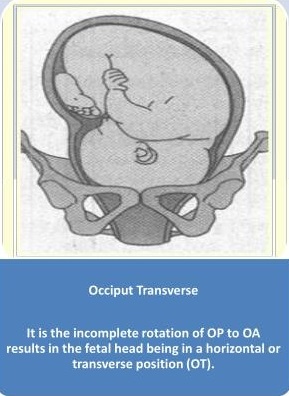 When a baby’s head is directly sideways, facing the hip, this is called Occiput Transverse or OT. Often OT positions are able to resolve to OA, but sometimes they do not and result in a vacuum extraction, forceps delivery, or cesarean. OT often occurs when the baby was posterior earlier in labor, tries to rotate to anterior, and gets stuck in the process of turning. Sometimes it is iatrogenic (caused by the provider). If labor is slow, the care provider may break the mother’s waters in an effort to speed up labor. This removes the buoyant cushion that can make it easier for the baby to finish its turn and the baby may end up “stuck” in this position. This is called “Transverse Arrest.” A fair amount of cesareans are caused by transverse arrest. Babies who have their hands up by their faces (a “nuchal hand” or sometimes a nuchal elbow/arm) can present another challenge. The baby is basically OA and in a great position for birth, but the hand or arm beside the head causes larger-than-average presenting parts that must fit through at the same time. If the care provider can get the baby to pull back its arm/hand near birth, the baby is likely to then be born quickly. If the arm/hand remains by the baby’s head, pushing is likely to be slow, painful, and difficult. Usually babies with nuchal hands can be born vaginally, but there may be quite a bit of tearing and damage to the mother. If the provider is not patient during a slow pushing stage with a nuchal hand/arm, it may result in a cesarean. Similarly, babies who have their heads tipped to the side instead of straight (“asynclitic”) also have difficulty fitting. Instead of the top of the head presenting first, their parietal bone (bony side of head) presents first. The tipped head causes a larger than average head diameter that doesn’t fit as easily. Many asynclitic babies will correct the tilt of their heads if the mother’s waters are kept intact and she is able to be mobile in labor. 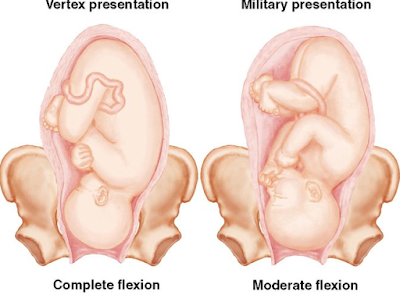 Asymmetric birth positions may help correct the tilt. Once the tilt is corrected, the baby is often born fairly quickly. You’ve already proven you can’t get a baby out of your pelvis. 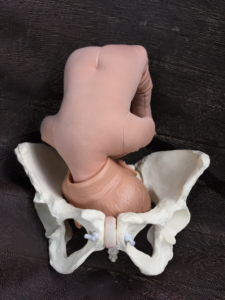 Obviously, that OB believed that the pelvis itself was the issue, not the baby’s position, but the recent Arrest of Descent study suggests it is likely not true. The OB that did my c-section told me that my pelvis was small and also tilted and that because of that, a vaginal birth wouldn’t be possible. Well, I…went for a VBAC anyway and it’s a good thing I did because I had a wonderful amazing and natural VBAC with my next baby. And she came out in about 4 pushes. It was so easy! I had my second VBAC with my son a year ago and it went perfectly as well! That’s not to say that CPD is never real. Sometimes it is. Although most cases of “CPD” are actually situational (caused by a malposition), sometimes there are rare cases of true CPD. These are usually a result of significant malnourishment in childhood, severe scoliosis, a history of rickets, or a history of a bad fall or accident where the pelvis was damaged. And sometimes, women don’t have any of that in their background, really do try everything, and still end up with a cesarean because the baby just didn’t fit. It does happen and it’s important to acknowledge that. But far too often, women who have had a cesarean after not being able to push out a baby are told that their pelvises are too small or defective, and they’ll never be able to push out a baby. This is not true. Many women with this history can have a vaginal birth, if given an adequate chance to do so. Anecdotally, many women who have been told this benefit from having a good chiropractor evaluate their back and pelvis to help maximize the space in it and get it well-aligned. See my story below. This includes me. I had my first cesarean after a difficult induced labor. I dilated to 10 cm and pushed for two hours in stirrups, but ended up with a very traumatic cesarean. With my second baby, I had a relatively easy spontaneous labor where I did all the “right” things including position changes but still had FIVE HARD HOURS of pushing with little descent of my deflexed OP baby. I ended up with a second cesarean for CPD. Both of my babies were big. I was told I had a “marginal” pelvis by my first care provider, and unless I had a smaller baby I would probably not have a vaginal birth. After my second birth, a nurse-midwife told me I probably had a pelvic shape predisposed to posterior babies and my babies would likely always be posterior. After two CPD cesareans at full dilation and after hours of pushing, I was told I was extremely unlikely to have a VBAC. The “VBAC Calculator” gave around a 20% chance of having a VBAC if I tried again. Near the end of my third pregnancy, I found a chiropractor who did a lot of work on my pelvis, including the Webster Technique and releasing the round ligaments that attach to the uterus. She felt my history of car accidents was highly relevant to the malpositions going on. According to her, the significant back and pubic pain I was having indicated “in utero constraint” that was making it hard for my babies to be in the easiest position for labor. The chiropractic adjustments eased a lot of my discomfort and the baby moved pretty quickly into a more optimal OA position for the first time in three pregnancies! I went on to have a VBAC after 2 cesareans (VBA2C), something many providers would have told me would be extremely unlikely with my history and risk factors (short, old, “morbidly obese,” big babies, two prior CPD cesareans, no prior vaginal births). Instead of pushing for 2 hours or for 5 hours as I did with my first two children, I pushed for 12minutes with that baby. The doctor didn’t even make it to the birth. And it wasn’t just a lucky fluke. Several years later, I had another VBA2C, this time with a baby that was a pound larger than either of my cesarean babies. I only pushed for 24 minutes with that baby. I have known women who have had VBACs after 1, 2, and even 3 prior CPD cesareans, including full dilation and pushing for hours each time with no vaginal birth. Yet they still eventually had a VBAC. The International Cesarean Awareness Network (ICAN) has a number of stories of women who have had a prior cesarean (or more) for CPD or Arrest of Descent and yet went on to have a VBAC. You can see some of them in their “Question CPD” video below. There are never any guarantees, of course, and there are important risks to consider with both VBAC and an Elective Repeat Cesarean. However, if you choose to labor, your VBAC chances are good, anywhere between 50-80% based on the research. Don’t let care providers convince you out of trying for a VBAC based on a past history of CPD or Arrest of Descent. In the end, it’s your decision. …This was a retrospective cohort study of all patients delivered by a single MFM practice from 2005 to 2017 with a singleton pregnancy and one prior CD for arrest of descent. We estimated the rate and associated risk factors for successful VBAC. RESULTS: We included 208 patients with one prior CD for arrest of descent, 100 (48.1%) of whom attempted a trial of labor after cesarean (TOLAC) with a VBAC success rate [of] 84/100 (84%, 95% CI 76-90%). Among the women who attempted TOLAC, women with a prior vaginal delivery >24 weeks’ had a significantly higher VBAC success rate (91.8% versus 71.8%, p = .01). Maternal age, body mass index, estimated fetal weight, induction of labor, and cervical dilation were not associated with a higher VBAC success rate. CONCLUSIONS: For women with a prior CD for arrest of descent, VBAC success rates are high. This suggests that arrest of descent is mostly dependent on factors unique to each pregnancy and not due to an inadequate pelvis or recurring conditions. Women with a prior CD for arrest of descent should not be discouraged from attempting TOLAC in a subsequent pregnancy due to concerns about the likelihood of success. …A systematic review of the literature was performed… for case series evaluating the morbidities of prolonged second stage of labor. Search terms used were “prolonged”, “second stage”, and “labor”. Prolonged second stage was defined as three hours or more. Retrospective case series of prolonged second stage in nulliparous women with epidurals were identified. The primary outcome was the incidence of cesarean delivery. RESULTS: Two retrospective series with 5350 nulliparous women with prolonged second stage were identified. 76.3% (4 081/5 350) had an epidural. Of all nulliparous women with an epidural, 11.5% (4 081/35 469) had prolonged second stage. Cesarean Delivery occurred in 19.8% of these cases (782/4 081), while 80.2% had a vaginal delivery. CONCLUSIONS: Over three quarters of nulliparous women with epidural diagnosed with a prolonged second stage deliver vaginally. [My summary of highlights from the full text] 501 women with 2 or more previous cesareans had a TOL, and 69% had a VBAC overall. Women who had had at least one previous cesarean for CPD had a 64% VBAC rate. Those who had had 2 successive labors both ending in c/s for CPD still had a 56% VBAC rate. In other words, even those women with a previous ‘failed’ trial of labor had a better chance of a VBAC than another cesarean in labor. Blog reposted with permission of Pamela Vireday. You can check out her original post here.